Here's an easy Christmas dog treat idea. Using a simple dog biscuit dough, cut out simple shapes that do not require a lot of fancy decoration for anyone to know what the biscuit is supposed to resemble! 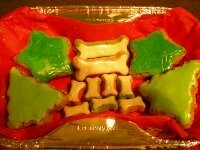 If you are a busy person, but would like to bring some Christmas biscuits for the dog to the Christmas party, don't worry about locating a fancy dog bakery, or trying to make gourmet decorated dog treats. This is a project even the kids can do. For example, we used a star, a Christmas tree, and a dog bone cookie cutter. These shapes can be cut out quickly. Once the biscuits are baked and cooled, the icing moves quickly as well. We mixed up a simple batch of royal icing for dogs using an all natural yogurt icing mix containing no fat and no sugar. This is important - without fat, the icing will NOT melt. If you choose to use yogurt chips, keep in mind that they contain a lot of fat and sugar which is not necessary for dogs. They have to be heated up to spread. So if your decorated dog treats are left in the car for awhile by mistake, you will not return to a gooey mess. Use the all natural non-melting royal icing and you will not have to worry. In the photo above, you can see the difference in the shades of green powdered colorings. Leaf Green was used on the trees and Emerald Green for the stars. Uncolored white royal icing was used on the dog bones. We purposely did not use red coloring. Red can be a difficult color and may not turn out vivid without applying several coats of icing. If you are in a rush, this may not be practical. However, red coloring is perfectly safe and if you have the time, it makes a beautiful color. See red colored Christmas dog treats and further discussion about red coloring for icing and frosting. To complete the presentation, place the green and white treats on a background of red tissue paper. Red is the perfect contrasting complement to green and will ensure your shiny treats stand out. We always like to present the treats in a foil bone-shaped dog cake pan, because it offers two gifts in one. The foil cake pan can be used by the gift recipient to bake a bone-shaped dog cake... or people cake if so desired.